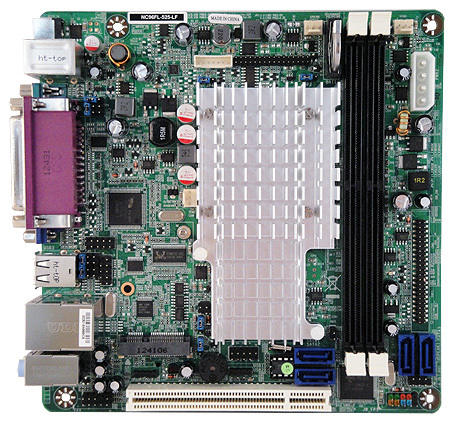 NC96 Series :: JNC96FL-525-LF / 510-LF / 410-LF :: Intel NM10 Chipset :: Atom Dual Core D525 / D510, Single Core D410 (Pineview-D) :: Mini-ITX Motherboard :: JETWAY COMPUTER CORP. External Power Supply – the board can be powered with a 12 V external power supply though a DC connector on the back panel. The rear 12 VDC jack accepts plugs with an inner diameter (ID) of 2.5 mm and an outer diameter (OD) of 5.5 mm, where the inner contact is 12 V and the shell is GND. Based on power consumption test results, the recommended power rating is 60 W (12 V/5 A).